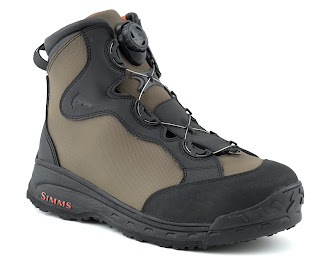 The New Simms Rivertek BOA Wading Boot - Now in Stock! The new Simms Rivertek Boa - Click to Enlarge! The long awaited Rivertek BOA boot from Simms represents their most fuss-free boot to date and have been getting rave reviews from all over the world! 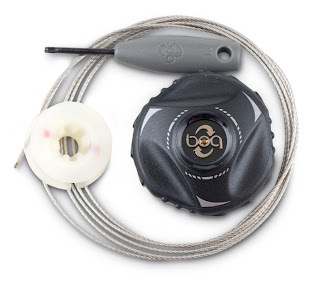 Featuring the innovative BOA M3 lacing system, just slip them on, crank the reel and you're off, no pressure points on your feet, no time wasted. There is nothing worse than untying cold, sodden laces at the end of a days fishing or even worse, tying them again the next day - especially with frozen fingers. You may have seen the BOA system before on Ski and Snowboarding boots where it has been used for a long time and has been proven to be durable in the toughest of conditions. Boa Technology was born in 1998, from an idea conceived by Gary Hammerslag when he took up snowboarding. He couldn't stand pulling so hard on the laces and the imprecise fit that too often resulted. He thought there had to be something better. There was indeed something better - the Boa Closure System. Gary melded his extensive background in medical catheters with his passion for and understanding of the outdoors, and built the first prototypes of a dial-based closure system that would first appear on snowboard boots in 2001. Since that time, Boa Technology has grown from a small office space, to a multi-national company based in Denver, Colorado. Today, nearly six million pairs of footwear with Boa Closure Systems walk, bike, hike, run, or ride the planet. That number includes some of the most accomplished, elite athletes, who have joined the Boa revolution and enjoyed huge success with the precise fit and comfort their footwear delivers. Plus BOA Technology also guarantee the BOA Closure System reel and laces for the lifetime of the product - however you can purchase a field repair kit if you wish to carry spares just in case! The BOA system is easy to maintain and repair! The quick-drying synthetic construction of these boots has minimal exposed stitching, a rubber toe cap provides durable protection against rocks and debris and the Rivertek BOA boot features the award winning StreamTread™ Vibram soles, providing superior traction and grip. 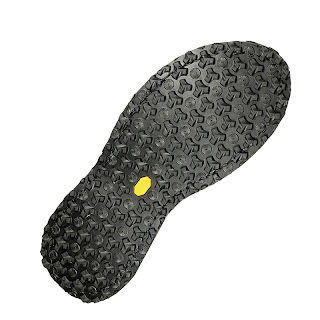 Like all of Simms' Vibram boots, the Rivertek will accept Hard Bite Cleats and Studs and here at GAC we recommend you fit these for extra traction if you are fishing in waters with smooth or slime covered rocks. We also recommend you keep the BOA system clean by simply rinsing out any grit or sand from time to time. A little maintenance will greatly increase the life of all your gear and it only takes a minute! The Rivertek BOA wading boot is also designed to the Simms Cleanstream philosophy, meaning that the features, design and materials all add up to a boot that is much more resistant to the harbouring and spreading of diseases and parasites - no more traditional laces to absorb water and micro-organisms, a big plus in the fight against aquatic invasive species. As a result, this design also makes them easier to keep clean and these boots are among the quickest to dry out as well which is great for the travelling angler.